TACLOBAN CITY – The national government has made available almost P1.8 billion for the rehabilitation of vital public buildings owned and operated by local government units in Yolanda-affected areas, Interior and Local Government Secretary Mar Roxas announced today. According to Roxas, the government through the DILG will release the funding allocation amounting to P1,791,400,000 beginning this month (April) subject to the complete submission by local government units of required documents. Roxas toured Yolanda-affected areas in Leyte province today to personally distribute the check for the rehabilitation fund to mayors who had submitted all the needed documents. He noted that the P1.79-billion fund comprises only the first batch of rehabilitation fund for LGU-owned buildings. The second batch, amounting to P358,348,047.54, is still being processed by the Department of Budget and Management (DBM). Roxas explained that the special funding was made possible through the Reconstruction Assistance on Yolanda (RAY), the national government’s strategic plan to guide the recovery and reconstruction of the economy, lives, and livelihoods in areas devastated by the Super Typhoon. The objective of the plan is to restore the economic and social conditions of Yolanda-affected areas to their pre-typhoon levels, while also establishing a higher level of disaster resilience. "Sinisimulan na namin ngayong buwan ang pagbibigay ng pondo para masimulan na ng mga LGUs ang pagpapagawa ng mahahalagang gusaling pampubliko na winasak ng Bagyong Yolanda," the DILG chief said. "Bahagi ito ng pagsisikap ng pamahalaan na pabilisin ang normalisasyon sa mga lugar na nasalanta ng bagyo at maibalik ang regular na serbisyo ng LGU sa mamamayan sa lalong madaling panahon," he added. The DILG has instructed all LGUs affected by Yolanda to submit their Program of Works (POW) for the rehabilitation of damaged public buildings in their respective areas, particularly the provincial, city, and municipal halls, public markets and civic centers. Of the 14 provinces and 171 cities and municipalities falling within the 50 km. radius of Typhoon Yolanda’s path, four provinces and 146 municipalities and cities were reported to have sustained significant damages on the three priority facilities. Reported damages of critical governance facilities in the 150 LGUs (4 provinces and 146 municipalities and cities) reveal that 92.3%, or a total of 323 facilities, are partially damaged while only 27 (7.7%) are totally damaged. The total cost of approved POWs for the partially-damaged facilities is P1,245,777,911.21, while total cost of submitted POWs for the totally-damaged facilities is P853,815,536.33. The biggest chunk of the rehabilitation fund for cities and municipalities will go to Tacloban City, which was allocated P230,687,979.22 for the repair of the city hall, public market, and civic center. For the provinces, Leyte received the biggest funding with allocation amounting to P801,804,911.17, or about 45 percent of the total rehabilitation fund. Allocation for the other provinces in Region 8 include P19,917,634.41 for Biliran; P100,219,564.57 for Eastern Samar; and P16,528,192.25 for Western Samar. In Region 6, the rehabilitation budget was divided with Iloilo getting the biggest slice of P78,829,195.17; followed by Capiz with P66,053,141.99; Aklan with P27,006,079.33; Antique with P24,877,150; and Negros Occidental with P5,152,267. 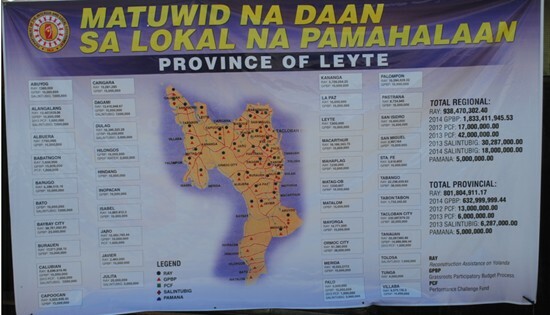 During his tour of Leyte province, Roxas reminded the LGU beneficiaries of the RAY fund to submit all the required documents at the soonest time possible so that the national government can expedite the release of budget allocation this April. Initial documents required include a Certificate from a Government Depository Bank on the LGU Trust Account where Funds will be deposited, and SP/SB Resolution authorizing the Local Chief Executive to enter into a Memorandum of Agreement (MOA) with the DILG Regional Office. "Inaasahan ko na kukumpletuhin ng mga LGUs ang mga dokumentong ito at ipapasa sa amin sa DILG sa lalong madaling panahon para mapakinabangan na agad ang pondong inilaan ng Pangulong P-Noy sa mga nasalanta ng Bagyong Yolanda," Roxas said. QUEZON CITY – Eight workers’ issues raised by labor group coalition Nagkaisa since May 2012 Labor Day are now in the hands of President Aquino to act on following a last minute series of meetings with members of his cabinet with the representatives of the group on Wednesday. Final details of the issues were threshed out in meetings that took place on April 8 with the secretaries of the Department of Labor and Employment (DOLE), Department of Justice (DOJ), and Department of Trade and Industry (DTI), and on the following day with the Department of Energy (DOE), said Alan Tanjusay, spokesman of the Trade Union Congress of the Philippines (TUCP). “After more than 100 man hours of discussions with different government staffs, undersecretaries and secretaries within the two year period, we think it is more than fair enough to say that the ball is in the hands of President Aquino. These issues are now on his table,” said Gerard Seno, executive vice president of the Associated Labor Unions-TUCP and a convenor of Nagkaisa. The issues that were finalized by the Nagkaisa and the cabinet level are for government to (1) ensure security of tenure of workers by criminalizing or eliminating contractualization of labor, enhance labor rights by deterring union-busting and actively prosecute extrajudicial killings of labor organizers and journalists (2) provide exemption and enhancement on minimum wage taxation, (3) institutionalize core labor standards in the agro-industrial plan, (4) address affordability and supply sufficiency of power, EPIRA reform, and labor representation in the Energy Regulatory Commission (ERC), (5) provide affordable housing program and non-violent transfer of urban poor communities from danger zones, (6) ratification of ILO Convention 151 – a convention concerning protection of the right to organize and procedures for determining conditions for employment in the government service, (7) approve into law the Freedom of Information measure and (8) ensure a jobs-led and workers’ sector participation in the planning and implementation of programs of the rehabilitation and reconstruction of Yolanda-hit areas. The group also expects Aquino to make an unequivocal commitment to his promised regular dialogue with Nagkaisa on emergent issues affecting the working class. Labor groups in Nagkaisa were always dismayed at Aquino’s alleged misunderstanding with workers’ issues raised by Nagkaisa every time he meets with labor group representatives over the traditional labor day breakfast since 2010 in Malacanang palace. “If we want to emphasize how important these issues are for Nagkaisa, well, we have expended substantial amount of unions’ financial and manpower resources for these meetings to enlighten executives the need for government to address these issues that endangers Filipino workers and their families today. As representatives of workers, we have done our part in transmitting these concerns to the administration. We will now observe very closely how the president will respond to these issues and how he treats the working people in the light of May 1 Labor day,” said Frank Mero, chairperson of Sentro. The group, however, emphasized that Nagkaisa will proceed with their Labor day activities regardless of Aquino’s response. “With or without President Aquino’s imprimatur on these issues, Nagkaisa labor groups will go on with our May 1 Labor day simultaneous activities nationwide. President Aquino may chose or not chose to favorably or unfavorably respond to some or to all issues we have raised to his attention, he has that choice. But Nagkaisa will pursue resolution of the issues at will whatever the cost and in any possible way because these issues are legitimate and important for workers,” added Wilson Fortaleza, spokesman of the Partido Manggagawa. Aside from ALU, Trade Union Congress of the Philippines (TUCP), PM and Sentro, there are 46 other member labor federation and workers’ organizations in Nagkaisa. It was established in April 2011, the other members of Nagkaisa includes Bukluran ng Manggagawang Pilipino (BMP), Federation of Free Workers (FFW), Public Services Labor Independent Confederation (PSLINK), Philippine Government Empoyees Association (PGEA), Confederation of Independent Unions (CIU) and KAMAO. TACLOBAN CITY – The People Surge alliance for Typhoon Yolanda survivors will call on Archbishop of Manila Cardinal Luis Antonio Tagle today to seek the blessings of the Catholic Church for their struggle for justice. The People Surge spokesperson added Bishop Deogracias Iniguez will celebrate the mass at Quiapo Church for the Yolanda survivors, after which a solidarity lunch and program will be held at the historic Plaza Miranda. “The survivors and their supporters will then hold a Senakulo procession in line with the Holy Week. This will dramatize the sufferings of the Yolanda survivors under the Aquino administration and the “Gang of Five.” The “Gang of Five” is President Aquino and his officials Interior Sec. Manuel Roxas, Social Welfare Sec. Corazon Soliman, Reconstruction Sec. Panfilo Lacson and Energy Sec. Jericho Petilla. PASAY CITY – Senator Chiz Escudero said the MRT corporate structure is a mess, causing delays in the implementation of long-overdue transportation projects aimed at improving the mass transport system. Speaking to reporters after a hearing by the Senate Committee on Finance to look into the financial absorptive capacity of the Department of Transportation and Communications (DOTC) to carry out projects, Escudero said the current system governing the Metro Rail Transit Corporation (MRTC) operational control and ownership remains a contentious issue that impedes the future development of the MRT. With the lifting of the temporary restraining order (TRO) sought by the MRTC to stop the DOTC from purchasing new trains, Escudero expressed optimism that there will be no legal challenges along the way. “Now that the TRO is already lifted, the DOTC has already given a notice to proceed to the train manufacturer in China. New trains will start coming in February of 2015, every month from then on there will be train deliveries. We hope the DOTC can really deliver on its schedule and not be stymied by one reason or another,” he said. According to Escduero, he will introduce a legislation that will require the posting of surety or cash bonds from parties who will seek injunctions against an ongoing government project. He said these bonds will be equivalent to the amount added to the actual project cost as a result of the delay and should also cover the economic losses of the government arising from the delay. “The government currently has fiscal spaces, the transportation agency should take advantage of this and deliver the much needed improvement to our public transport system and provide relief to the riding public,” Escudero said. OAK BROOK, IL – McDonald's (NYSE: MCD) today announced that multi-platinum recording artist Chris Daughtry and entertainer Wayne Brady will share their talents with contestants in the fifth biennial "Voice of McDonald's" global singing competition, held as part of its global convention in Orlando, Fla later this month. Sixteen global semi-finalists were selected from a field of nearly 58,000 restaurant employees representing 63 countries competing for the "Voice of McDonald's" title in Orlando and a $25,000 grand prize. Top music industry professionals selected the semi-finalists, who will receive a star-studded experience and benefit from expertise in vocal coaching and stage presence. Additionally, fans around the world can vote for their favorite semi-finalist from April 7-28 at www.voiceofmcdonalds.com. The Fan Favorite winner will receive an additional $5,000. "We're proud of the opportunities available to McDonald's employees, and this program adds a whole new layer of excitement," said Rich Floersch, executive vice president and chief human resources officer at McDonald's. Chris Daughtry, lead singer of the Grammy-nominated band Daughtry, will serve as a mentor to the semi-finalists and judge the competition, along with David Foster, multi-platinum, Grammy Award winning music producer and composer; Ken Hertz, prominent entertainment attorney and brand marketing strategist; and Skylar Grey, Grammy-nominated singer/songwriter. As a multi-platinum recording artist Chris brings a unique perspective. "I know what a competition can mean to a developing artist's career," said Chris. "I couldn't be more excited to partner with McDonald's and mentor these contestants like I did during this season on American Idol." Wayne Brady, Grammy-nominated vocalist and Emmy Award winner, will be the master of ceremonies for the semifinals on April 28 where the contestants will perform for thousands of McDonald's employees, Owner/Operators and suppliers. From there, four employees, one from each global region, will be selected to perform in the May 1 finals, where the winner will be announced. "I got my start in show business by working as a crew member for a major brand, paying my dues and taking advantage of great opportunities," said Brady. "I can relate to these young people who are looking for their big break. What a cool chance McDonald's is giving them to showcase their talents and learn some early career tips that could help their musical dreams come true." The Voice of McDonald's grand prize winner will receive $25,000. The second prize winner receives $17,500, third prize winner receives $12,500, fourth prize winner receives $7,500, and all other contestants will win $3,000. All 16 semi-finalists will receive $500 for a celebration party with co-workers at their restaurants and a $1,000 donation in their names for their local Ronald McDonald House Charities or other children's charity. To learn more about the Voice of McDonald's finalists and to view live webcasts of the competitions on April 28 and May 1 visit www.aboutmcdonalds.com or www.voiceofmcdonalds.com. You also can join the conversation by following the competition on Facebook, Twitter (#voiceofmcdonalds), and Flickr. CAMP LUKBAN, Catbalogan City, Samar – New People’s Army violated human rights anew when it abducted and killed a former New People’s Army at Brgy. Magdawat Pinabacdao, Samar on March 9, 2014. Based on the report from Lt Col William P. Peñafiel Jr., the Commanding officer of the 52nd Infantry (CAFGU) Battalion based at Brgy. Caticugan, Sta Rita, Samar, Allan Rafales, called aka “Benny” a former rebel was forcibly taken by NPA insurgents around 9 a.m. on March 9, 2014. It was reported that aka “Benny” was participating in a Pintakasi or cockfighting event at Brgy. Magdawat when he was kidnapped. His lifeless body was found around 5p.m. of the same day. Aka “Benny” surrendered to the 52nd Infantry (CAFGU) Battalion on January 6, 2012, as he wanted to start a new life with his family. After receiving his benefits from the Office of the Presidential Assistant for Peace Process of OPAPP, he was released from the custody of 52IB and went home to Sitio Canlobo, Pinabacdao, Samar purposely to cultivate a small lot as augmentation to support his family, until that fateful day when he was killed by the rebels. When members of his family were reached out, they confirmed that their father was forcibly taken and killed by the rebels, but they were not around when the crime happened. It was only relayed to them by their relatives. They added that, their father was vent on starting a new life, but it was cut short by the rebels when they killed him. The case of aka “Benny” is just one of the crimes against humanity that the NPA rebels have been doing for the past 45 years. They are saying that they are the defenders and protectors of the rights of the poor yet they are doing otherwise. How many more aka “Benny” will the rebels kill? How many more children will be orphaned because the NPAs do not want their fathers to lead a normal and peaceful life for their families? Maj Gen Jet B. Velarmino AFP, the Commander of the 8th Infantry Division said: “For almost 45 years, many Filipinos have been victims of NPA operations. We enjoin everyone to condemn in strongest terms the violence and killings the rebels are perpetrating. “The use of armed struggle to attain political ends is not acceptable to the Filipino people and has no place in a civilized and democratic society. It is a thing of the past as it will only bring misery and poverty among our people. Let us then give peace a chance and not resort to violence to attain political ends as the NPA is advocating,” he added. TACLOBAN CITY – The czar of demolition, not reconstruction, is the correct job description for Sec. Panfilo Lacson, the People Surge alliance of Typhoon Yolanda survivors said today.